Below are just a few ideas to consider when exhibiting for the first time. Having decided at which shows you want to exhibit you then need to consider whether you should book a shell scheme or a space only stand; and indeed what size space to book. A shell scheme is a booth supplied by the organisers and will normally consist of an aluminium framework with white infill panels, usually around 2.4m high. Typically a shell scheme is used by a first time exhibitor or smaller company to ‘test the water’ and make sure exhibitions work for them. Shell schemes can then be kitted out with portable display equipment such as Pop-ups or Banner Stands. Space only stands enable you to achieve a much higher profile, even with a small space-only booking. Typical heights of 3m will give you a far greater presence than shorter shell scheme walls. 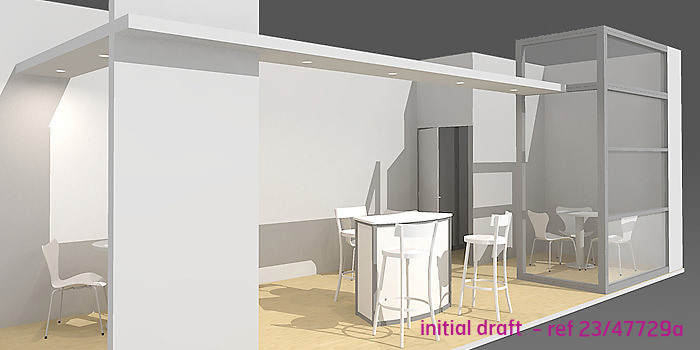 A space only booking is literally just that and you will need to commission a stand designer/contractor. Many first time space-only exhibitors might use a hire stand from the contractor to ‘test the water’. When booking your space/shell scheme it is important to study the floor plan so that you don’t book a position right opposite a main competitor, and you might find it beneficial to position yourself adjacent to the exhibition entrance or coffee area. It is often best to use an Exhibition Stand Designer/Contractor close to where you are based as this will enable you to visit their premises and get a better feel for the service they can offer. You can then find out if all of the stand design, graphic production and stand construction done in house. Look through their portfolio of recent work produced and check out comments and testimonials from previous customers. Can they offer as pre-build of the stand prior to the exhibition? Are they able to offer storage of the stand and do they have hire stand options? There are many ways to dress your shell scheme ranging from full length graphic panels which can fit directly onto the walling supplied to widely used Pull-up Banner Stands and Pop-up Display Stands. Ideally it is best to completely cover/obscure the plain white shell scheme panels. This can be done using Multi Linked Pop-ups or Linked Banner Stands. A good portable display equipment company will be able to advise and illustrate via a CAD drawing the number of units required to fit a given shell scheme stand size. E) When do I start organising the stand? The size and complexity of the stand will determine when you should start your planning. A 3x3m shell scheme being fitted out with Multi Linked Pop-ups can be organised in a very short time (production of pop-ups and graphics is 10 days, approx), whilst larger space-only stands require a lot more planning. A minimum of 3 months should be allocated for an 18sqm stand, and more time for larger stands. The sooner you have things organised the better you will feel about the up-coming exhibition and you’ll be able to concentrate on the strategy for the open day of the exhibition itself.